Out of an abundance of caution, we are cancelling the Friends of Indian River meeting tonight, Jan 18th. Temperatures will be dropping below freezing around the time of the meeting and we are concerned about icing in the parking lot. We will hold the elections for our board and officers at our next monthly meeting on Thursday, February 15, 7 PM in the Social Hall at the Oaklette United Methodist Church, 520 Oaklette Drive, Chesapeake, VA. Happy New Year! 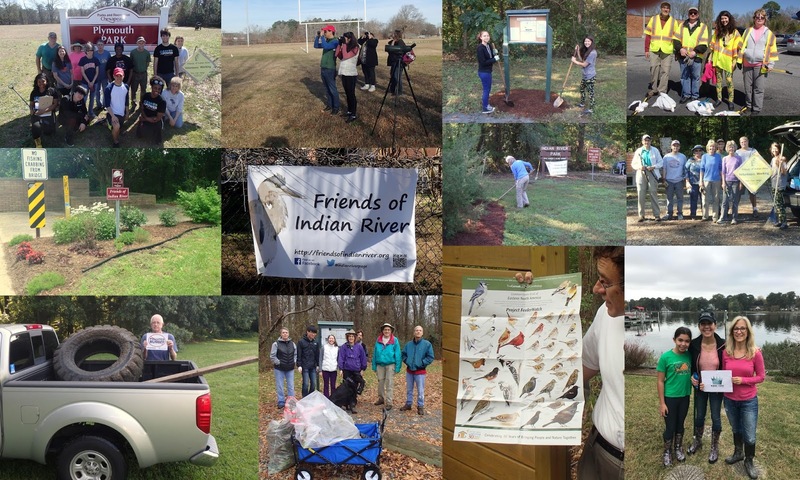 The Friends of Indian River invite you to attend our Annual Meeting on Thursday, January 18, 7 pm at Oaklette United Methodist Church. We will hold elections for our officers and board members, and discuss plans for 2018. Join us as we discuss plans and priorities for 2018, hold elections for our officers and board, and discuss plans for coming year. There will be light refreshments and door prizes. Meet at the park entrance at Rokeby Ave. and Main St. (2001 Rokeby Ave.) which is located just south of Military Highway, i.e. across Military Highway from the Fire Station. We'll be focusing on removal of invasive species, primarily English Ivy. The more volunteers that come out the more that we can accomplish! Please wear closed-toe shoes, a hat and bring work gloves. We will have water and lots of snacks. (We also always encourage folks to bring their own water in reusable bottles to minimize use of plastic bottles). Participants under 18 years of age must have adult supervision. Thank you to the seven volunteers - and one adorable dog - out on a gorgeous morning in December for a cleanup at Plymouth Park. We removed about 150 lbs of trash from the park. See some pictures here from our First Day Hike at Indian River Park. We had a great turnout, with 16 people enjoying the crisp weather on New Year's Day. We are very proud to announce that the Elizabeth River Project is recognizing us as a "River Star Business" at the Model Level, their highest level of achievement! The Elizabeth River Project called out our exceptional accomplishments in pollution prevention, wildlife habitat enhancement, recruitment and mentoring of others in the community, and leadership in environmental stewardship.